With a record high 91% market share in the Philippine e-Commerce category, Lazada Philippines has plenty to celebrate for its 5th year anniversary. Since its recent acquisition by global e-Commerce giant, Alibaba.com, the country’s dominant online shopping and selling destination shows no sign of slowing down. 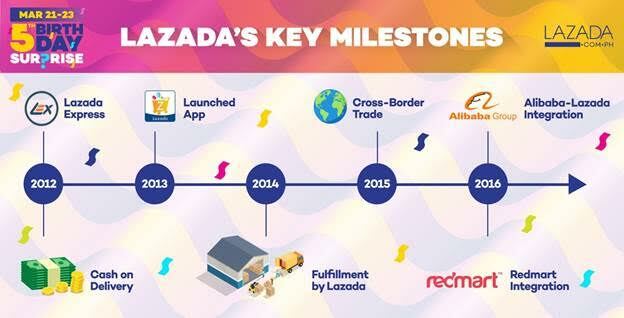 In just 5 short years, Lazada has been able to guard and grow e-commerce in the Philippines with commitment to its 3 main customer offerings: assortment, convenience, and topnotch service. When it comes to variety, no other Philippine e-commerce platform comes close to Lazada, with 6.3 million items under a wide variety of categories including electronics, fashion, home & living, travel, toys, grocery items, and even pet goods. Convenience and service are best in class with 24/7 access via website or mobile app, free shipping around Metro Manila and nationwide with a minimum purchase of P1,000, and free returns. Lazada also innovated through a wide variety of payment options, including credit and debit cards, and the highly popular cash-on-delivery option. Lazada’s upcoming anniversary, dubbed ‘Lazada’s 5th Birthday Surprise’, has been marked as the biggest shopping event of the season. From March 21-23, Lazada will be showering online shoppers with sitewide discounts of up to 90%, low denomination Peso Sales, and time based Flash Sales. There will also be exclusive offerings from its most popular brands, and raffle prizes like vacation packages and real world treats. 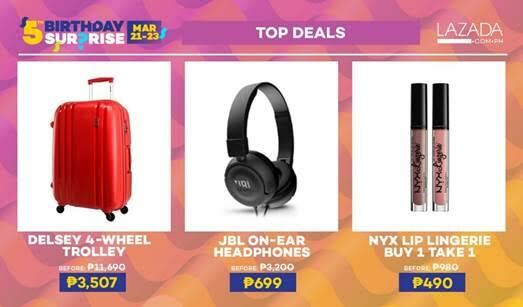 Make your summer sizzle with hot deals such as the Delsey 4-wheel trolley for only P3,507; JBL on-ear headphones for only P699, and Nyx Lip Lingerie for only P490. Also in the lineup are customer favorites such as the VR Box 3D Glasses for only P95, Keds sneakers for as low as P999 and assorted Nestle Dolce Gusto capsule packs with free Nestle Dolce Gusto Oblo machine for only P3,400. 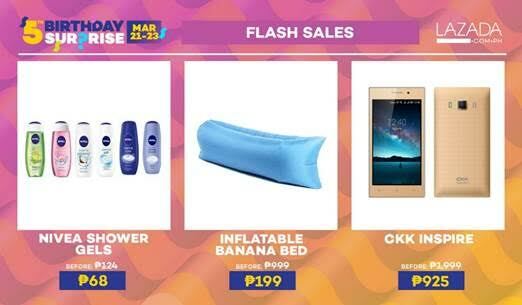 For a very limited time, Lazada will also be offering top items at markdown prices: The inflatable Banana Bed for only P199, Nivea shower gels for only P68, and a CKK Inspire mobile phone with a 5.0 mega pixel camera and dual sim capability for only P999. Other fierce items include an Avision24” HD LED TV and a Matrix Air Conditioner at P4,999, and a car stereo Bluetooth player for only P699. No birthday will be complete without giveaways! For lucky customers who shop from March 21-23, Lazada will be raffling off a trip to Taiwan for two from KKDay. Foodie customers also get free booky.ph subscriptions worth P1,500 with every minimum purchase. Finally, every minimum purchase of P1,000 becomes a true treat, because customers get a P10 discount on FamilyMart’s famous Twirl. So mark your calendars, make your checklists, and make room for more stuff because Lazada’s 5th Birthday Surprise is going to be the main event on your March calendar! Celebrate with Lazada by visiting Lazada.com.ph or downloading the Lazada mobile app for free today.